Just off of Main Street in Disneyland, there is a little cart that sells corn dogs. But these are not just any corn dogs, these are dogs of corn that personify the Disney difference. Where another theme park might be content to boil up some prepackaged corn dogs, the corn dogs of this stand are battered and boiled in-cart. Although a typical corn dog isn’t nearly enough to fill up this unvegan, I was told these were some heavy dogs and took my chances on just one. Coming in at $5.99, the dogs come with a choice of chips or apple slices. Having tackled a half-pound burger for lunch and just about do down a similarly-sized corn dog, I opted for the apple slices. Within moments, my corned dog was ready for eating. We headed into the restaurant nearby to escape from the freezing (50 degree) weather and sat down to chow on some dogs. This was one hell of a huge hot dog. It was hard just to get my mouth around it, but when I did, I bit into something delicious. 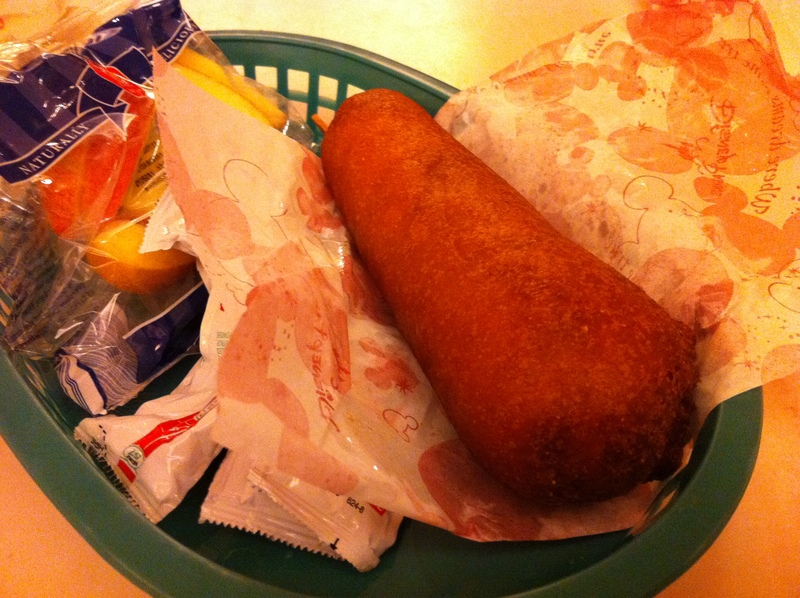 This was a corn dog done just perfectly. It was nice and crispy on the outside, warm and gooey on the inside and had that delicious tube steak in the middle to provide balance. To steal a line from There’s Something About Mary, “I don’t think there are enough meat on sticks” and a corn dog like this proves the point. Not only that, but you know how a hot dog or even a corn dog is seldom enough food for a whole meal? This corn dog was some heavy stuff, so full of fried Disney magic that I was pretty sure it would settle in my stomach for happily ever after. When I was done even the apple slices seemed like too much to eat. For the size, price, taste and heaviness, the corn dog cart off of Main Street is a great place to grab a meal at Disneyland. It doesn’t seem like much, but the supposed snack is a true meal that packs a punch of meat and won’t keep you away from the rides for too long. So true! 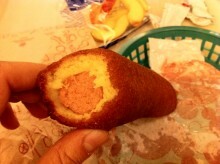 Love the corn dog, the most unhealthy option.